Each year Paso Robles Wine Country comes together to recognize one of their own who has exemplified the spirit of the Paso Robles wine community with outstanding leadership and vision in promoting the region. Just last month, Justin Smith of Saxum Vineyards was awarded the 2013 Paso Robles Wine Industry Person of the Year award at the Paso Robles Wine Country Alliance’s annual winter gathering titled Evening with the Stars, themed after the recent Wine Enthusiast Wine Star Award for the 2013 Wine Region of the Year. 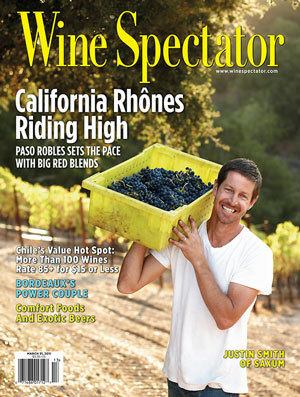 Justin Smith featured on the cover of Wine Spectator Magazine. Justin Smith is a second generation farmer who began making wine in 1998. Growing up in a farming family, respect for the land and passion for farming was established early in life and carries on in his philosophy as a winemaker and grower. In 2002 Justin and his wife Heather established Saxum Vineyards, whose wines quickly gained critical acclaim bringing attention to the Paso Robles region. Justin and Saxum Vineyards gained his most notable accolades with the 2007 vintage of James Berry Vineyard wine, scoring a perfect 100 point score with The Wine Advocate and subsequent number one wine in 2010 with Wine Spectator Magazine. Both recognitions were milestones for the Paso Robles region as this single wine was the first to be recognized with such honors from both publications. In 2011 Smith was awarded the San Luis Obispo County Agriculturalist of the Year, further establishing him as a leader in the agricultural community and reinforcing the honor of earning the 2013 Paso Robles Wine Industry Person of the Year. The Evening with the Stars event hosts more than 200 members of Paso Robles’ wine community with elected officials and representatives from national, state and local offices on hand to commemorate the honor.